C&F Inc. teleporters are going offline all over the place, and it's up to an intrepid frog employee to fix the situation in this run & gun action platformer by Cave Story creator, PIXEL. 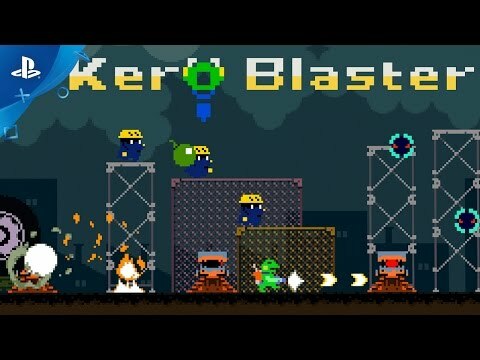 From the creator of Cave Story comes Pixel's latest work; Kero Blaster. The C&F Inc. teleporters are going offline all over the place, and it's up to you, an intrepid frog employee and master of the Custodial Sciences, to fix the situation by riding the company's teleportes of strange black creatures. Fight for your life through a menagerie of unique monsters while getting your hands on exciting new tools of the trade. Save C&F! Blast bizarre creatures! Be a frog! Frog - Our hero! An employee of C&F, they are charged with the unenviable task of ridding the company's teleporters of strange black creatures. Cat - Co-worker in R&D. A decidedly generous individual who, from time to time, gives gifts. Clearly appreciates others. Pink - The nurse, assistant, subsitute Custodial Artist and shop-keeper; what doesn't Pink do?! Change guns constantly and keep thinking tactically! It's the only way to survive! Kero Blaster is an adorable game, but the classic retro art should act as a disclaimer to anyone who remembers the challenges of the 8-bit era. Understanding the encounters, strategization and execution are of paramount importance. Depth of gameplay sets Kero Blaster apart from other games--players will feel rewarded for thinking ahead, for playing precisely and without hesitation. Bubbles bounce, dropping below to decimate enemies; underwater, however, they flow upward providing relief from dangerous obstacles and menacing aquatic creatures. The blaster upgrades allow long-range attacks to deal with enemies that are tricky up close. Each weapon works differently, so experimenting will help players find what works for them in each situation. See Kero Blaster in action!